Big Wheelin' is a rhythmic tune that keeps movin'! This song explores melodic drum fills intertwined with a rhythmic melody. One of my favorite rides as a kid was riding my “Big Wheel”… It was my first taste of freedom to ride down Trinkaloe Rd. and explore the great twists and turns of our street. 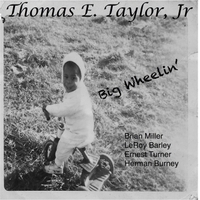 The Big Wheel was a fast toy that was a “mean turning machine”, so is this tune. As a native North Carolinian, Thomas continues the tradition of making music swing and touching the soul of the listener in the same manner that Max Roach, John Coltrane, and Thelonious Monk did on their recordings from two generations earlier. This group of musicians are all deeply rooted in God, swing, and perfecting their craft as musicians.